While camping is fun because it opens different outdoor adventure opportunities for the whole family and a chance to spend time together out in nature, it’ll be more rewarding if we get the chance to watch our favorite TV shows. For this reason, you’ll need the best RV antenna. 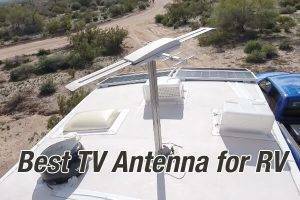 It’s a special TV antenna designed and made for mobile environments, such as campers, travel trailers and recreational vehicles. They receive great TV reception and allow families to enjoy their favorite shows and games while onboard and on the move with their RV. However, choosing the right antenna for your vehicle can be challenging, as there are many choices on the market. It’s the exact same reason we’ve put up this buying guide and top picks. We do hope you can find the right TV antenna that is right for you and your family later. If you’re ready, let’s begin with a buying guide and then the reviews of the best RV TV antennas on the market now. 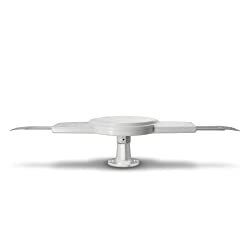 RV TV antennas are available in different types based on the signal it receives and location of its installation. With the right one, you can watch your favorite shows while camping; some even allowed connecting to the internet for its Wi-Fi capability. The best ones also have a long range and are able to get better signals. 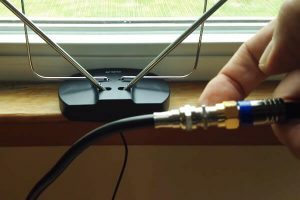 Using the right antenna, you also get to enjoy your local shows without subscription because it picks up signals and feed the TV with local channel receptions. In the following, we’ll help you pick the antenna for you based on types as well as a bit about a special device called a signal booster, which can help pick better signals for more channels to watch. Before buying a TV antenna for your recreational vehicle, you should also know how to select whether an outdoor or an indoor antenna is best for your situation. These types are based on where you install the RV antenna. An outdoor antenna is usually installed on the roof of your vehicle and works more effectively if you want to pick up more RV shows. On the other hand, there is the indoor antenna installed inside the RV. It is chosen by those who want to use their antenna in one location, but it might have a lower range than an outdoor antenna has. You don’t have to take it outside for a TV reception and does not require an angle adjustment. A device that goes hand in hand with the outdoor antenna for better reception and more channels is the outdoor antenna booster. It works by boosting the signal so that you can watch with a clearer reception. The outdoor booster is easy to install. All you have to do is to snap it on the outdoor antenna for more channels. While it is not a requirement, it is essential if you’re traveling from one campground or location with your RV more often and you want a better signal reception for a more enjoyable TV watching experience. Just like the outdoor antenna booster, the indoor booster will be able to boost the signal that the indoor antenna will receive. The device is compatible with indoor antennas, which can then receive more usable reception than without it. By turning it on, you and your loved ones will be able to watch more TV shows and that’s also without having to angle adjust the indoor antenna because this booster will increase its capacity in receiving more channels with clearer reception. Usually, you’ll find it close to where the power cord is, and it just requires you to turn your TV on for it to start working. Another somewhat technical aspect when it comes to RV TV antennas is whether they’re directional or multi-directional. Remember that the directional TV antenna only picks up signals originating from a narrow band range of about 50 to 60 degrees wide. On the other hand, the multi-directional type is more effective when picking up signals with a total band range between 100 and 200 degrees in different directions. With it, your TV might be able to pick up a few signals coming from all directions. Without even saying, a multi-directional antenna might be the better choice if you want more functionality and power for your antenna. In addition to the above aspects/characteristics of recreational vehicle TV antennas, the types of antennas based on the signal they receive are another consideration when shopping around for a good antenna. This factor will help you ensure the antenna matches the TV or service with which you plan to use it. In the following, discover the types of antennas according to the kind of signals that the antenna receives. So before deciding to buy one, you should also first determine the kind of channels – satellite TV channels or UHF/VHF/Digital and HD TV free program channels – you want to receive. Do you want satellite TV on your RV? If you do, you might want to choose a dome antenna, which is made to receive satellite signals. However, take note that you need to pay a monthly subscription on top of the cost of the satellite TV antenna. The satellite TV antenna basically works with your satellite TV service provider, such as Dish or Direct TV. 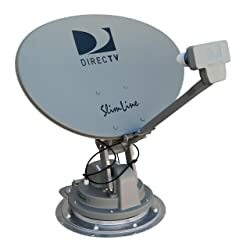 For RV owners already subscribers of satellite TV services, they opt for this type of antenna in order to receive satellite signals while camping. With it, your loved ones can watch their favorite programs and shows anywhere. 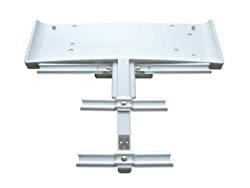 These antennas are the most basic antennas for the camper, mobile home or recreational vehicle because it is effective when it comes to picking up both VHF and UHF signals, while others are also able to receive signals from HF channels, including CBS and others, based on where you are parked or camping. Using a UHF/VHF/Digital and HD TV free program antenna, you can find and pick up many channels and receive a good reception. It is also easy to install and use. Just turn the TV on and scan for channels, and the antenna will search and lock on the TV signals that it can pick up. Another step to keep in mind and follow is to determine the signal strength of your mobile home. It only means that you should first look for the broadcast towers, which are in relation to where you are currently parked. By doing so, you can check out the kind of reception to expect as well as the type of TV antenna that will work best for your situation and needs. Online, you can find some help when it comes to determining some broadcast towers currently located near you. Nevertheless, you can get the best results from your TV antenna if it will be able to pick up as many signals and lock them on wherever you are by first determining the signal strength of your RV or home. Aside from your home’s signal strength, another thing to consider when choosing an RV antenna to affect your buying decision is the kind of material it’s built. What is the material or type of materials used in the construction of the antenna? Why does it matter? Material has to do with the performance and durability of the antenna in some aspects. 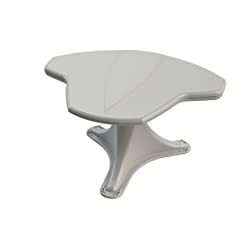 You should go for a product that does not only give solid performance but also offer lasting durability. For the best results, you might want to go for those made of aluminum materials if you’re buying an outdoor antenna, but plastic if for an indoor antenna. The gain and range is another factor to consider when buying an RV antenna. What is it? It refers to the antenna’s ability in picking up signals. That is why if your RV is in a remote place located far away from a transmission center, you might want to opt for a model that has an excellent gain and range. By doing so, you will be able to boost even those weak signals. Without even saying, an RV antenna with a good range and gain will be able to work better than those with a poor one will. This is the best RV antenna for recreational vehicles that want an excellent antenna that works best for the mobile environment and changing locations. The antenna is featuring the performance of the SENSAR III, which adds to its excellent functions. In addition, this mode is also built-in with the improved UHF-enhanced antenna of the Wingman for that RV TV viewing. I liked that the antenna is able to receive most of the available channels, which can be up to 55 mi away from your RV. It only means that we can watch our favorite shows whenever and wherever we are without any hassles. The Wingman antenna also gives your loved ones the chance to watch free HD channels, depending on your location. I also liked that the Winegard RVW-395 is also easy to install and use, allowing users to lower or rotate it with the hand crank coming with it from your vehicle’s interior. And regarding ease of use, this antenna also comes with a lift assembly and amplified antenna together with a 12V direct current plus an on/off switch. Everything you need is included in the purchase. So if you’re looking for the ultimate RV TV antenna, you might want to consider the Winegard RVW-395. It is durable and made particularly to meet the demands in a recreational vehicle. Using it, you can have peace of mind that your loved ones will get more of their viewing experience wherever your recreational vehicle is parked. It offers solid performance that can deliver clear channels for the best viewing experience. The Winegard SK-1000 is the best satellite TV antenna for RV owners looking to get an excellent reception and better viewing experience aboard their recreational vehicle. It is an automatic multi-satellite TV antenna that offers an outstanding performance, allowing you and your loved ones to get the same clear and vivid viewing experience as if you’re home. Another thing I love about the Winegard SK-1000 is its ability to offer us with separate programming on different televisions at the same time. 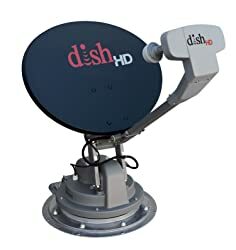 So if you have a family with different viewing needs, you might want to opt for the DISH satellite TV antenna that lets you watch your favorite shows anytime, anywhere. I also find it flexible because it is also compatible to use with DVRs, allowing you to watch and record using different satellites at the same time. The Winegard Trav’ler SK-1000 is an excellent choice if you’re looking for satellite TV viewing just like what you will get when you’re home. Another thing I appreciate about it is its ability to offer both HD for Bell TV and Dish and standard programming. More so, I find it versatile that it can also work with the Dish Hopper. Indeed, the Winegard Trav’ler SK-1000 is worth the buck of every RV owner looking for the best satellite TV antenna for roof mounting. You can check it out if you’re looking for a reliable RV antenna to meet your family’s viewing needs. Are you looking for a great signal strength meter? You can depend on the Winegard RFL-342 that makes programming easy and fast, allowing your family to enjoy their favorite shows with better signal quality. One thing I loved is its easy operation that just needs you to rotate the Sensar antenna until you located the strongest signal strength before running a channel scan. This SensarPro model is integrated with amplification, providing up to 10dB gain that improve performance. The SensarPro can also lower the antenna gain when it is near a specific transmission tower. In addition, the SensarPro signal strength meter is what you need if you’re looking for an intelligent model that has an adjustable audio feedback, which helps in locking in signal whenever its wall plate is unreachable. This signal strength meter is also compatible to work with all the Sensar antenna models. It can also be used in replacing current power supply. This model also has an adjustable amplifier, which lets users reduce or increase gain with just a press of a button. Each purchase also comes with all the accessories needed, including two pieces of spade connectors and wall plate, to name some. Nevertheless, the RV signal strength meter is one of the best choices on the market if you’re looking for solid performance and high quality product that can meet your requirements. Buying an RV antenna might not be enough if you want consistency in performance. 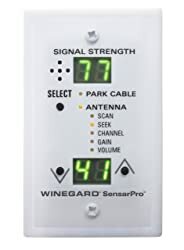 For this reason, you might also want to get an antenna booster like the Winegard RV-WING antenna booster, which is effective when it comes to improving UHF reception for up to 100%. This model is able to optimize an existing Batwing antenna for the digital channels available. Another thing notable about the Winegard RV-WING is its ability to pick up many free TV channels, giving you and your loved ones more channels and options and channels, such as weather, local news, top rated shows and live sports. You won’t miss any of your favorite TV program again if you have the RV antenna. Even in the lowest signal areas, the antenna is able to pick up and lock in signals, offering your family with more viewing options. Another thing I would like to note is its easy installation, which also requires no tools. Overall, I liked the features and functions of the RV TV antenna that allows camping enthusiasts and RV owners to enjoy modern convenience of watching their top TV shows and programs while aboard the vehicle. It is made with high quality and durable materials and has solid functions to deliver outstanding performance wherever you are. The KING OA8300 antenna is one of the best choices if you’re shopping around for the right RV antenna that will last long and perform solidly to deliver your needs. One thing I noticed is that this antenna is “less directional” versus traditional antennas on the market, offering more channels without you having to rotate the TV antenna very often. In addition, I would like to recommend the TV antenna because of its solid performance – thanks to its integrated amplifier, which is powered using a COAX utilizing the 110V power injector, which is included in the purchase. If you love to pick up UHF signals, you might want to take a second look at the KING OA8300 antenna, which is able to offer more than 80% of new DTV channels. I also liked that the TV antenna is able to provide better performance when it comes to the reception of current VHF channels. Plus, this over-the-air antenna is also up to 70% smaller than any traditional antennas on the market are. One more thing I should note is that the antenna offers less wind resistance, and it is so easy to install on the RV roof or home attic. Finally, this model is backed by a year of parts warranty for peace of mind. So if you’re looking for a good replacement antenna, you should not miss the KING OA8300 Jack Replacement antenna. It can deliver solid performance and has top features that make it a decent choice for those finding the right replacement antenna for their recreational vehicle. If you’re shopping around for the best over-the-air antenna for your recreational vehicle, you should not miss the KING OA8500 Jack, which is one of the easiest to install and use. It takes only minutes to set it up! Another thing I love about the antenna is its ability of providing more free channels with better signal reception, allowing us to watch our favorite TV shows without any hassles anytime, anywhere. 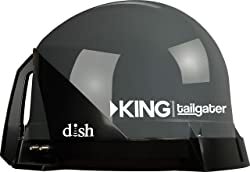 This directional antenna for the RV is making use of the latest technology when it comes to picking up more signals and locking them in wherever we’re parked, giving us the convenience of watching our top TV programs and shows. One more thing I appreciate about this antenna is its complete package, coming with a built-in signal meter and mount, saving us money for not buying these accessories separately. Both of these inclusions are able to up the performance level of the TV antenna, yet the model is also compact and lightweight. This antenna is for you’re looking for a longer range of signal acquisition versus its counterparts. So when it comes to solid performance, durability and ease of installation, you might want to take a second look at the KING OA8500 antenna. It is one of the best antennas on the market now for its durability and quality materials, yet it is offered at an affordable price. One of the most powerful RV antennas I found that I must include in today’s top picks includes the Continu.us Omni-Directional Antenna. It offers solid features and top performance, offering 360-degree reception and up to 55 miles of range. I liked that the amplified RV antenna is worth the buck when it comes to performance that it is also ideal to replace an old and damaged RV antenna. As it is also omni-directional, users don’t need to point it to a point where there is a strong signal because it has the ability of location a good signal from all its sides. This model is also convenient to install and offer two different TV outputs and has the feature to boost the signal from both TVs. 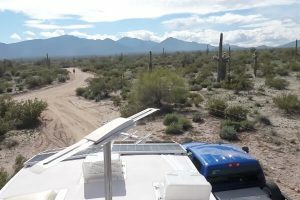 Another thing notable about the antenna is it offers both VHF and UHF that can deliver great HD signals based on the RV’s location and its distance from a broadcast antenna. I appreciate that this antenna also has a weatherproof design to deal with the elements and a low profile build to prevent damage, discoloration and fading. Being weatherproof, you can have peace of mind that it stays durable no matter the kind of weather outside the RV. One more TV antenna for the recreational vehicle not to overlook is the 1byone Amplified RV Antenna, which features a nice and modern design for an outdoor antenna. It is sleek and has a low profile design, which makes it sits in place and prevents damage to the antenna. Another feature of the RV antenna is its 360-degree omni-directional reception, allowing it to receive signals from all directions without you having to rotate it often unlike traditional outdoor antennas requiring you to adjust receiving direction for a better signal. You also don’t have to pay for an installation fee for choosing the RV antenna because it is much easier to set up for its complete accessories. It will also save you money because the signal you receive to watch your favorite TV shows and programs are free forever. With it, you don’t have to pay for satellite or cable TV subscription again. If you’re looking for a quality and durable antenna that delivers optimum performance, you should not miss the 1byone Amplified RV Antenna, which also offers an HD experience to your digital-ready TV. It is a complete and high quality RV antenna that can meet your family’s viewing needs. 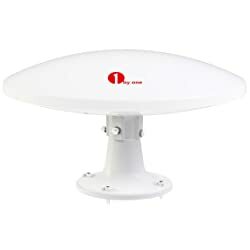 The KING VQ4500 is one of the best choices for a satellite TV antenna, which you might want to use for your DISH satellite service. This portable RV antenna offers great performance and delivers high quality signal for a superb viewing experience. This model is ideally designed for outdoor and sporting fans and enthusiasts as well as suitable for second homes, tailgating parties, recreational vehicles and campsites. It is a versatile choice that will give you more flexibility on how you use the antenna. The TV antenna is also one of the easiest antennas to install because it can work immediately after installation. With the antenna, you also don’t have to pay for monthly subscriptions or bills because payment is simple with the pay-as-you-go service, which only bills users for the months it is used. 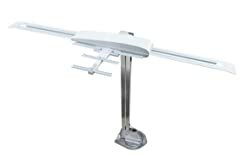 This antenna, which is exclusive for DISH SD or HD service is also versatile that it can be roof mounted if desired. You also don’t need additional brackets to install it. This model also includes an powered over coax along with a 50-feet coax cable, making it easy to install for the complete accessories that come with the antenna. Overall, the KING VQ4500 is the choice if you’re looking for a no-hassle satellite TV viewing wherever you are. It is also the lightweight and portable TV antenna for the RV owner that is looking for convenience of use. It is the decent choice for RV owners that want a durable and high quality TV antenna that offers solid performance. If you’re shopping around for a good RV TV antenna that works compatibly for your mobile home, you might not have to look any further if you have the Winegard SK-SWM3. 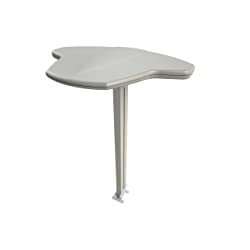 It is a part of the slim line series that gives it a sleek and modern design, which matches your RV perfectly. I would also like to note that the mobile and automatic antenna is one that can deliver us with a clear and crisp Direct HD programming viewing experience. Using it, you don’t have to worry about missing your favorite TV shows and channels for its ability to pick up and lock in signals, even the weak ones coming from a farther transmission tower. This model is offering us with multi-satellite viewing, allowing us to watch any TV program aboard our vehicle. Regarding its construction, the Winegard SK-SWM3 is also built with certified and approved reflectors, which can offer a strong signal anywhere your RV is parked. I also liked that this model is lightweight at only 53 lbs, a height of 9.75 inches and dimensions of 44″ x 34″ (LW). The RV antenna is one of the most reliable when it comes to its ability for an automatic satellite signal acquisition without you having to reposition or read just the angle of the antenna. This product is also backed by two-year of parts and one-year labor warranties, giving you peace of mind that there will be help when needed. When it comes to programming, the RV TV antenna can provide high definition and standard TV programming. There you have our buying guide and reviews of the best antennas that you can choose from and install on your recreational vehicle. All the top picks featured above have their uniqueness, solid features and top performance that you can rely on for long lasting use. They’re also made specifically for mobile environment use and with the ability to deal with harsh weather elements, especially the outdoor antenna types. When it comes to signal acquisition and locking in, the products we’ve featured above are proven to offer great ability to pick up, receive and deliver great quality signals. With the right TV antenna for your recreational vehicle, you can have peace of mind that your family and loved ones will be able to get more out of their camping experience. They can watch their favorite shows and programs while on board, and you don’t have to pay for monthly subscriptions because the best antennas also pick up even free HD channels depending on your location. Buy the best RV antenna today!